Highlands School Barcelona wants to create a new focal point for the school by using the project of the Highlands House System with all the families and students of the school. The Highlands House System is a traditional characteristic of the British schools and is similar to the college system in University. The famous Bishop Cotton School, founded on July 28, 1859, was one of the first schools in the world to start with the implementation of the idea of a houses system, as a resource to organize games and sports in school as part of the daily co-curricular activities. The goal of the project is to create a sense of pertinence and proud of Highlands School Barcelona, developing union and strength between the students, and offering a dynamic motivation during the school life at Highlands Barcelona. With this approach, every student has a sense of pertinence towards his/her house, considering it as family, since the student will stay in the same house during his/her school time. Room in school, which the students will decorate as they wish, to carry out different activities. The functioning of our Highlands House System during the school year it’s a competition between the different houses, in which points are gained or taken away by carrying out the activities. At the end of the school year there is one winning house. The activities to be taken into account are going to be attitude, punctuality, respect, obedience, academic results, results during the Highlands week etc. Saint Andrew, patron saint of Scotland, was the first disciple of Jesus. He was born in Bethsaida, on the Sea of Galilee, and worked as a fisherman. Saint Andrew was originally a disciple of Saint John the Baptist and left everything behind to follow Jesus. He preached the gospel in Asia Minor and was martyred by crucifixion in Greece. He asked to be tied to an X-shaped cross because he deemed himself unworthy to be crucified as Jesus had been. Saint Andrew is depicted bound to an X-shaped cross or holding the Gospel, symbol of his preaching. 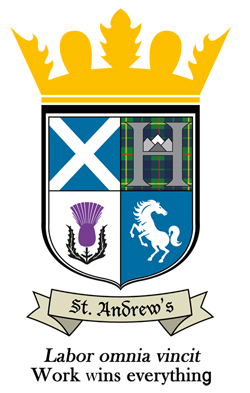 Saint Andrew’s House coat of arms contains the banner of Saint Andrew, the white saltire on a field of blue; the Highlands School emblem on a field of Scottish tartan; the horse and the thistle, symbols of the house. The golden crown evokes heavenly reward. The main colours of the house are blue, white and violet. 30th November is Saint Andrew’s Day. Saint Andrew’s House main values are: hope, humility, generosity and responsibility. Its members try to conduct themselves with regard and sense of duty. Saint David, patron saint of Wales, was born circa 500. He became a priest, engaged in missionary work and founded many monasteries. He led a life of austerity and prayer, labour and intense study. Saint David was declared archbishop by popular acclaim and became a spiritual leader throughout Britain. He died about 590. Saint David is pictured standing on a mound with a dove on his shoulders, symbol of his impressing eloquence. 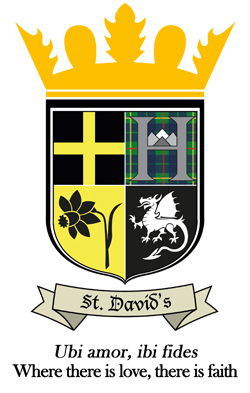 Saint David’s House coat of arms contains the banner of Saint David, the yellow cross on a field of black; the Highlands School emblem on a field of Scottish tartan; the dragon and the daffodil, symbols of the house. The golden crown evokes heavenly reward. The main colours of the house are yellow, white and black. 1st March is Saint David’s Day. Saint David’s House main values are: charity, purity loyalty and effort. Its members try to carry themselves with kindness and reliability. Saint Georges, patron saint of England, was born circa 280. He originally came from Cappadocia (now Turkey) and served the Roman army. When Diocletian started his persecutions against the Christians, Saint George declared himself to be a Christian and thus denied the false idols. He suffered many tortures because of his faith and died as a martyr circa 303. Saint George is depicted as an equestrian slaying the dragon, symbol of the conquering of evil. 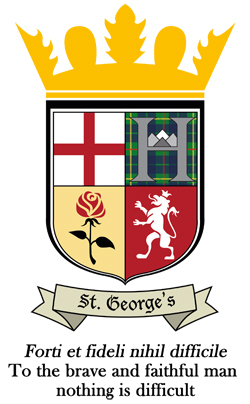 Saint George’s House coat of arms contains the banner of Saint George, the red cross of a martyr on a field of white; the Highlands School emblem on a field of Scottish tartan; the lion and the rose, symbols of the house. The golden crown evokes heavenly reward. The main colours of the house are red, white and gold. 23rd April is Saint George’s Day. Saint George’s House main values are: justice, strength, bravery and honour. Its members try to behave with righteousness and courage. Saint Patrick, patron saint of Ireland, was born circa 385 in Britain. As a boy of fourteen or so, Irish riders captured him as a slave to herd sheep for six years. He converted to Christianity and returned to Ireland to spend the rest of his life working as a Christian missionary. He died in 461. Saint Patrick is pictured driving the snakes, symbol of the cleansing of paganism, or showing the three leaves of the shamrock to explain the Holy Trinity mystery. 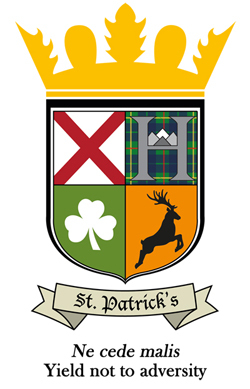 Saint Patrick’s House coat of arms contains the banner of Saint Patrick, the red saltire on a field of white; the Highlands School emblem on a field of Scottish tartan; the stag and the shamrock, symbols of the house. The golden crown evokes heavenly reward. The main colours of the house are green, white and orange. 17th March is Saint Patrick’s Day. Saint Patrick’s House main values are: faith, honesty, commitment and perseverance. Its members try to act with truthfulness and dedication. Forge well-rounded people with a high level of knowledge. Encourage them to give the best of themselves. Engage them with the world around them. Ensure that they are happy. 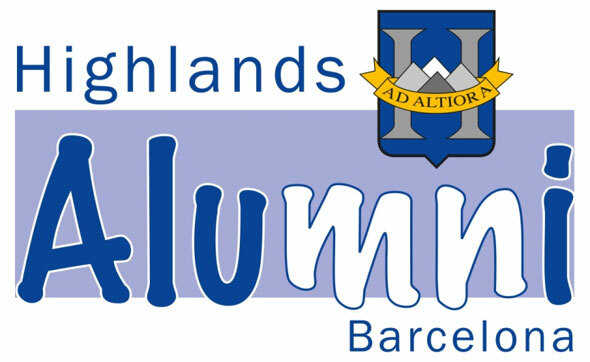 Highlands School Barcelona will always have its doors open to our alumni community. We want them to visit us, to explain how they see the school, to tell us about their future plans, to give us advice… Being a Highlands pupil is a period of their life but they will be part of the Highlands family forever. That’s the reason why we want to be in touch with them by social networks, but we also invite them to parties at the school. That’s our way of showing gratitude for their tenure at the school. If you are Alumni, don’t miss our latest news posted on our Facebook page and Instagram! The family is an essential part of our education community. It is important to pupils that their parents make a commitment to taking part in school activities so that pupils can feel proud to be a part of their school. We had the idea of starting up a House System, like the English system, to aim for a higher implication of the whole family in the school community. Public classes: Parents come to observe how we apply our pedagogical system. This takes place in Pre-School (years P3 and P5) and in Primary education (2nd, 4th and 6th Grade). Presentation classes: Pupils in 2nd and 4th Grade Secondary present what they have learned through the year to their parents. Father’s Day: This is one of the most important days at our school. The fathers of Pre-school pupils take part in various activities prepared by their children. Mother’s Day: This is one of the days most looked forward to by our Pre-school children. Mothers take part in various activities with their children. Grandparents’ Day: This is the sweetest day at the school as grandparents take part in a baking competition. Prizes are awarded to the most original, the sweetest and the best-tasting cakes. The pupils prepare a number of activities for the grandparents and enjoy the cakes at the end of the day. Family Day: On this day, the families enjoy the school facilities and a number of activities that make the pupils feel proud of their own school. Festivals: At Christmas and the end of the school year, our Pre-primary and Primary pupils take part in these festivals. Teacher’s Day: This day aims to create better relationships between the faculty and pupils, while also enabling the children to thank the teachers for their dedication. The pupils are allowed to give “hand-made gifts” to their teachers, which they make at home either alone or with the help of their parents. Ongoing training: Our faculty receives training related to their pedagogical and formative mission. Native and/or bilingual teachers: All the teachers who teach any subject in any language are native or bilingual in order to achieve academic excellence.